Drey commented in my previous post that the hard-to-find Lolly's Citadel is on Ebay. In short, the house needs some major work. Even God has no idea why someone put Victorian furniture in there and some of the worst wallpaper and flooring known to mankind. The house is being auctioned for $750 or best offer. The catch? Pick-up only in Chicago. See Drey's blog post for more details. Hey! If you bought it, let us know what you do or plan to do to restore this structure to glory! UPDATE: CallSmall bought it! Lucky duck--ha ha! I'm sure she will blog about this venture. I'm glad we'll get to see it evolve from the abused state it is currently in. Looks like that it's accepted a best offer of $400 (final price sold). You are right about that it will need a lot of TLC to undo the wallpaper and flooring. wow. That was quicker than expected. It's been up for a few days. I confess, it was me! My brother and sister-in-law live in Chicago and I decided to take the very big gamble and give a best offer. I was actually surprised when it was accepted. I am committed to restoring it and am honestly a bit overwhelmed at the prospect. I am willing and open to hear any advice, recommendations, etc., from this supportive community! My first task is getting it to me in New Jersey and really seeing first hand its condition. I'm still a bit in shock! Congrats! At least this house is in good hands now. Also, you got a good deal at $400--I think that's what the unbuilt kit used to go for. Awesome - I like this construction better than the stained wood exterior. I'm so glad someone from the blogs bought it. What a great house! Congrats, Callsmall. I have to confess that I found the Victorian decor hilarious. But I do look forward to seeing photos of its renovation. only $400? i expected it to go for a wee bit more... could not afford it PLUS shipping... and for something like that i'd be clueless on restoring it! i can't wait to see what CallSmall does with it! anything would be an improvement to the flooring now there! I'm glad that callsmall bought it. It's comforting to know that it will be rid of its current Victorian decor. Congrats callsmall. Hi Modern MC -- I posted on the Citadel [http://call-small.blogspot.com/search?q=Citadel], and also left an update, since I heard from Lolly's. the store is still open, and I will visit it when we take our road trip out to pick up the house. That's very cool, call small! Can't wait to hear all the details. This is gonna be a fun project for you that's for sure. 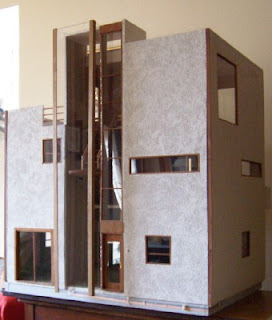 The dollhouse of all modern dollhouses, my dream dollhouse was up for aution and I missed it! I think I actually would have flown to Chicago to pick it up. I must see pictures, no I demand it. I and so jealous, but happy someone is going to restore it. I have been after that owner forever to make the Citadel again. Well as long as it goes to a good home. I have the Citadel by Lolly's and I would like to sell it. It is in Lakeland, FL and would have to be shipped or picked up. All I have done is to "popcorn" the ceilings.